Glamour spells are used to change your appearance and make you look better or different to other people. While they certainly do work, a lot of people have some misconceptions about this type of magic because its used so much in TV and movies. You can't actually change your face and make yourself literally look like another person, or do anything really drastic like change what color your eyes are. But a good glamour spell can have some subtle effect on how you look, especially if you go about it the right way. The most typical approach is to make yourself more attractive, which isn't about trying to change your actual features. So as long as you're not trying to turn yourself into some kind of super-model or take another person's place by looking just like them, you are going to be more successful with your spellwork. This is a simple place to start, and it's a spell that doesn't change how you look but just makes people notice you. Great for social events where you are hoping to meet new people (for romance or otherwise), or even at work when you want your boss to see how you're doing. This charm creates a strong positive energy that will attract people in your direction. 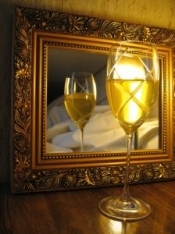 Fill a glass with wine, and drop in the mirror. Let it sit overnight. Take it out the next day and let it dry (don't wipe it off though). After that, you're ready to go. Carry this with you, and people will start to pay more attention to you. The effects aren't permanent, and the charm will only last about 7 days. Like I said, most glamour spells are intended to make you more attractive so even though I have a page already for beauty spells, I'm adding another one here. Mix the two oils together in a little dish or saucer. Add a little silver glitter. Dip your index fingertip into the mix and draw a big heart on your stomach. Draw a circle inside the heart. There should be enough glitter in the oil that you can see the shapes. Visualize positive and attractive energy coming from the image and covering your entire body. Leave the oil in place for the day (wear something comfortable over the image but not too delicate, the oil may stain). At the end of the day, take a bath to wash it away. The first day is the most powerful, but the effects can last up to 3 days after. Leave the Glamour Spells page and go back to the main well-being spells page.